Cadillac Window Fashions has been delivering and installing wood shutters to our valued clients for over 30 years now. With wood shutters providing numerous benefits, many make the decision of installing them into their homes. All our installations are performed by factory trained installers to insure top-quality installations. 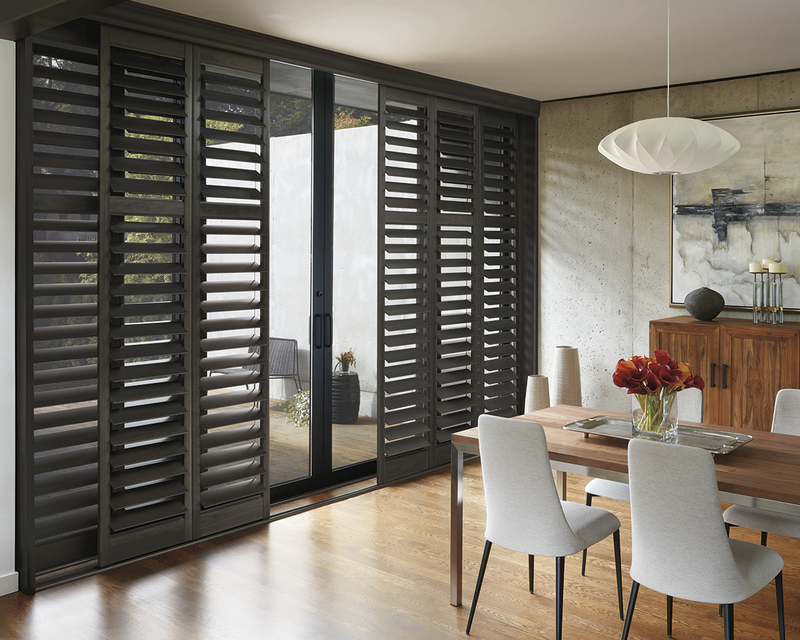 Cadillac Windows Fashions takes a look at the many benefits of these wood shutters, discusses the stylish Hunter Douglas options that we offer and more about our custom-made durable California Shutters. See how these beautiful wood shutters will complete the look of your rustic décor this fall. Our wood shutters offer many benefits. All of our shutters are Canadian made and protect against harmful UV damage. They create an amazing upscale look for your interior and can be matched to any type of interior. Love the rustic décor look for this fall? No problem, we’ve got wood shutters to match your interior. All our wood shutters can be repainted for extended life, so if you’re interior changes, you can change your shutters as well. Our Hunter Douglas shutters provide maximum privacy and openness as desired. Not only can you adjust your shutters to your personal taste, they also provide energy savings by insulating heat in the cold Canadian winter time and will help by reflecting heat from the outdoors during the hot summer months. Some of our shutters also come with dual operation push rods, which control the intensity and direction of sunlight. At Cadillac Window Fashions, we offer a variety of Hunter Douglas products. 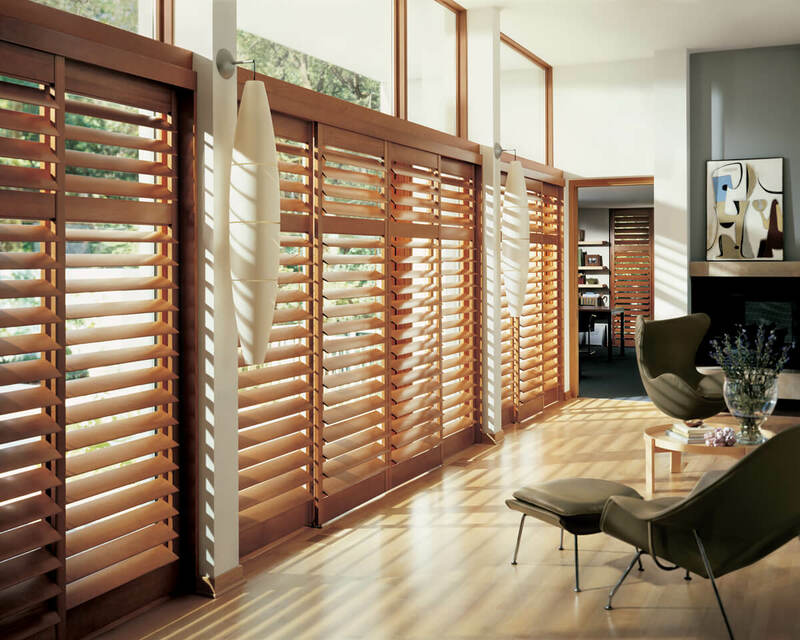 If you’re looking for new shutters for your home, consider getting our Hunter Douglas Palm Beach shutters. The plantation-style shutters are made with UV resistant polysatin compound, so they’re guaranteed to never fade, chip, peel or discolour, regardless of any extreme heat or moisture that might occur. The Palm Beach shutters also have aluminum bracing and resin blocks reinforced for added strength and stability. Our other Hunter Douglas shutters, called NewStyle are plantation-style shutters as well, which have real wood and advanced modern-day material. This combination creates stunning window coverings for any room. The Finetech finish coatings on these wood shutters provide you with long-lasting smooth satin finish that makes cleaning extremely easy. You can simply dust them every now and then with a soft dry cloth. We have been providing wood shutters and California shutters to residences and business in Toronto and the GTA, as well as Southern Ontario for over 30 years now. We provide our clients with the option of custom-made, economical wood shutters, with the objective of surpassing your expectations and meeting your budget. We have a variety of unique colors and stains available to make sure your new wood shutters mesh perfectly with your home interior. Our end goal is to provide you with a product that is aesthetically beautiful, matches your home and remains within your budget. Customer service is something we pride ourselves on. We always strive to give our clients the best possible products for their home and will do whatever it takes to make our clients happy and satisfied. All installations are performed by factory-trained installers who are also fully experienced in working within our customers’ homes in Toronto, Scarborough, Woodbridge, Oakville, Thornhill, Mississauga, Richmond Hill, Newmarket and Markham for over 30 years. Please contact us for a free in-home consultation.